Lumbar pain is ubiquitous. Due to the health burden and the fact that most axial lumbar pain is self-limiting, we cannot investigate all patients with expensive investigations. We rely on the 'red flags' and inflammatory parameters. This case highlights that one investigation does not override the rest. Despite a normal CRP on two occasions, lumbar pain can be due to a pathological cause. In the end the surgeon needs to evaluate all information, with the patient's history being equally important in planning management. Unfortunately what works most of the time is not correct all of the time, and repeated examination may be necessary to get to the root of the problem. Lumbar pain is ubiquitous. Most people will experience this symptom in their lifetime. It is typically self-limiting and not dangerous. There is a huge societal cost to manage it and in an effort to select those with underlying dangerous pathologies, the so-called 'red flags' are taught. In addition, basic laboratory tests such as inflammatory parameters and plain X-rays are used to exclude a dangerous pathological cause. This case report highlights the inherent danger in accepting any one modality as diagnostic. Despite normal inflammatory parameters, this case had a progressive pathological cause. 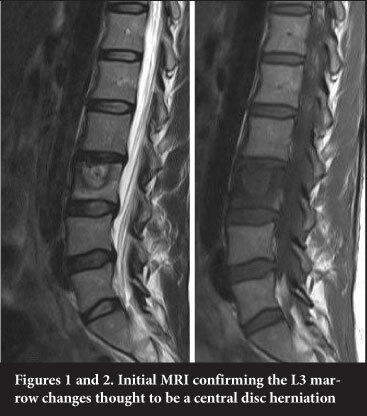 A 48-year-old, well-nourished woman developed an insidious onset of mid-lumbar pain in January 2011. The pain was axial in nature with no radicular component. There were no constitutional complaints. It became more acute when picking up an object and she consulted a neurosurgeon. He requested X-rays and recommended physiotherapy and NSAIDs. Her level of function remained good and she managed a trip overseas. On her return, her axial symptoms deteriorated somewhat with associated poorly localised right leg pain. She sought a second opinion by an orthopaedic surgeon in July 2011. He requested bloods and an MRI scan. The bloods were normal (CRP was 2.5, ESR 23). The MRI scan confirmed L3 endplate and body changes. It was reported as 'L3 intrabody disc herniation/superior end-plate fracture with marked adjacent marrow reactive change. Features are not typical of disc space infection' (Figures 1 and 2). The surgeon thought this to be a degenerative condition and offered her a L2/3 TLIF but she returned to her first surgeon and continued a conservative programme of Pilates exercises. The pain persisted however and required daily medication. She saw a third surgeon who found her to be fit and well. She had normal spinal motion but lumbar pain on lifting a moderate weight with outstretched arms. She had no tenderness and was neurologically normal. A repeat CRP and FBC were normal. A bone scan demonstrated uptake in both L2 and L3. A repeat MRI confirmed progressive changes to now involve L2 and L3 (Figures 3-6). She then presented to the author with anxiety regarding the possibility of cancer rather than complaints of physical symptoms. She was normal on examination and had functionally improved when compared to earlier in the year. She was attending Pilates and using NSAIDs most days. As the MRI had shown progressive change over time, a biopsy was performed. A low yield was expected with a percutaneous technique in the light of no constitutional symptoms. Additionally multiple tissue samples were required in case of a strange organism. Thus a left lateral muscle splitting retro-peritoneal approach was used. The L2/3 annulotomy was performed yielding a small amount of pus. The L3 endplate defect was curetted and an allograft femoral ring placed. The following day, Mycobacterium tuberculosis was confirmed on PCR. The PCR sensitivities confirmed that the organism was sensitive to first line drugs and Rifafour* was commenced. One sample cultured Staphylococcus epidermidis. This was considered a contaminant. Histology was suggestive of tuberculosis with necrosis but no granuloma or AFBs were seen. The diagnosis was subsequently confirmed on TB culture. The patient was managed in lumbo-sacral orthosis for three months. By four weeks the pain was completely resolved. CRP is a member of the pentraxin family of proteins. It is thought to act as a surveillance molecule for altered cells or certain pathogens. It is secreted by the liver in response to a variety of inflammatory cytokines as part of the innate immune system. It binds to Fc receptors, acting as an opsonin for various pathogens and activates complement. CRP increases 4-6 h after an inflammatory trigger and peaks at 36-50 h. Levels decrease rapidly with the resolution of inflammation. It is frequently used in clinical practice to diagnose inflammation and infection. Due to its relatively short half-life, it is useful to monitor a trend when managing an infection. The normal range varies. The laboratory involved with this case initially used 10 mg/dL as the top of the normal range at the time of this patient's management. They have subsequently revised this down to 7.5. Piper et al1 investigated pre-operative CRP and ESR use in patients planned for removal of hip, knee and shoulder arthroplasty as well as spine implants. They divided their 646 patients into septic and aseptic groups based on clinical features of infection or evidence of histology or positive culture. They found a significant difference in CRP levels between the septic and aseptic groups in all procedure groups. The ESR was significantly different in all except the shoulder arthroplasty removal group. Using CRP >10 as abnormal, they found that the sensitivity in identifying spine infection was 57% with a specificity of 85%. Using an ESR > 30 there was a 64% sensitivity and specificity of 83%. When using either a positive CRP or ESR, the sensitivity was 79% and specificity 75%. They determined an optimal ESR cut-off of normality in spine implant infection of 45, with sensitivity of 57% and specificity of 90%. The CRP optimal cut-off was 4.6 with 79% sensitivity and 68% specificity. A further problem is that TB infection can be relatively indolent. In a well-nourished host, the disease may be contained and thus not generate a marked inflammatory process. We are well aware of this in the clinical arena where patients often present late to the insidious nature of the disease. Kang2 investigated CRP in pneumonia in an effort to discriminate between TB and bacterial origin. They found the TB cases had a lower CRP with an average of 5.27 mg/dL (0.24 to 13.22). This is within the normal range and highlights the problem. Wilson,3 in a South African study, investigated the use of CRP in smear-negative tuberculosis patients. They divided their patients into three groups, viz. confirmed TB on culture, possible TB based on chest X-ray manifestations and no TB. They found the mean CRP to be 15.4, 5.8 and 0.7 respectively. Two per cent of the confirmed TB cases had a normal CRP, with 20% of the possible TB and 59% of the no TB patients having normal CRPs. They found that HIV had no effect on CRP values in their patient cohort. Thus they reported a CRP sensitivity of 98%, specificity of 59%, PPV 74% and NPV 96% in confirmed pulmonary TB. It is thus clear that although CRP is a useful marker of infection, it is not foolproof. It should thus not be allowed to override other clinical concerns such as ongoing pain and MRI changes. There is always a small chance that there is infection despite a normal CRP. No benefits of any form have been received or will be received from a commercial party related directly or indirectly to the subject of this article.